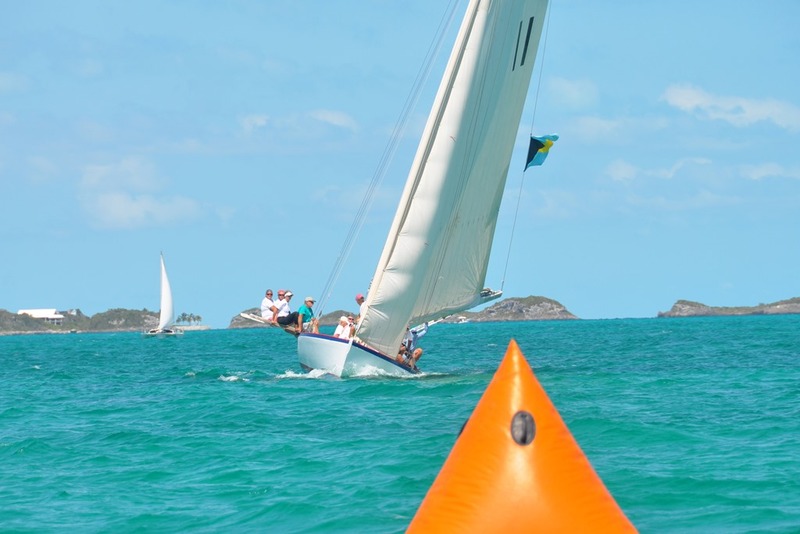 A picture perfect Bahamian day – the last race of the season. We’re on Rage, a Class A traditional racing sloop. Races were postponed from Wednesday (due to 0-5 kt winds) until Thursday — predicted at 5-10 but actually 12-15 with gusts. Rage lives on a mooring at the south end of the harbor. She doesn’t have an engine, so we sailed her out through the moored fleet. 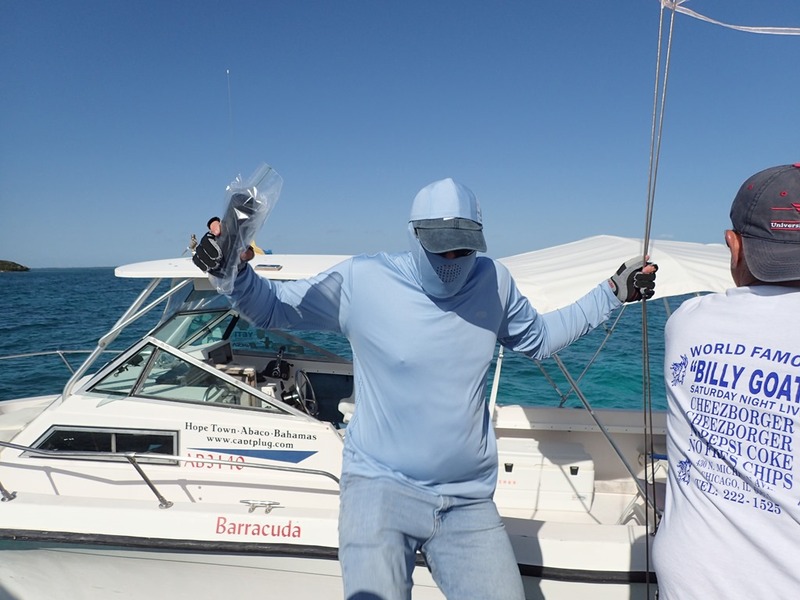 Eric, on our chase boat, anchored his runabout “Barracuda” outside the harbor and literally “hopped” onto Rage as she sailed past. Just 3 minutes before the start, we decided to reef. 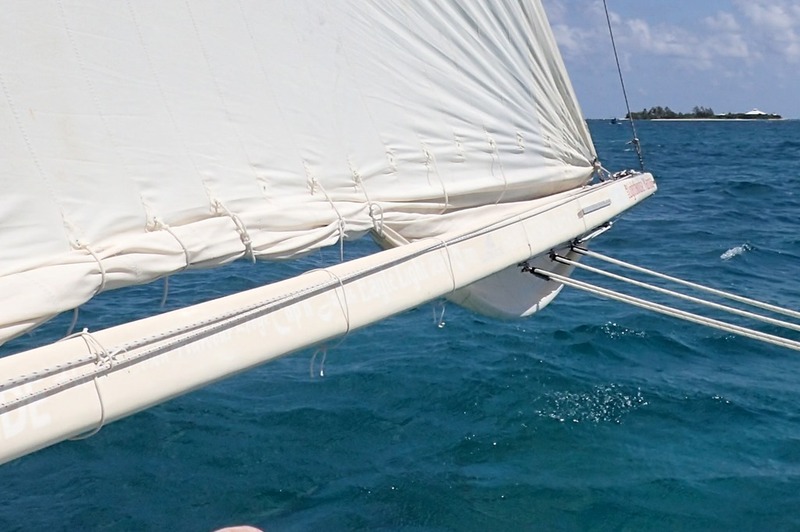 Rage has a loose footed main (means the sail is attached to the boom at either end but not in the middle), so reef lines several feet up the sail are tied together to scrunch up the bottom part of the sail to reduce sail area. Except that the boom extends 10 feet beyond the end of the boat and we couldn’t reach those reefing lines while underway. 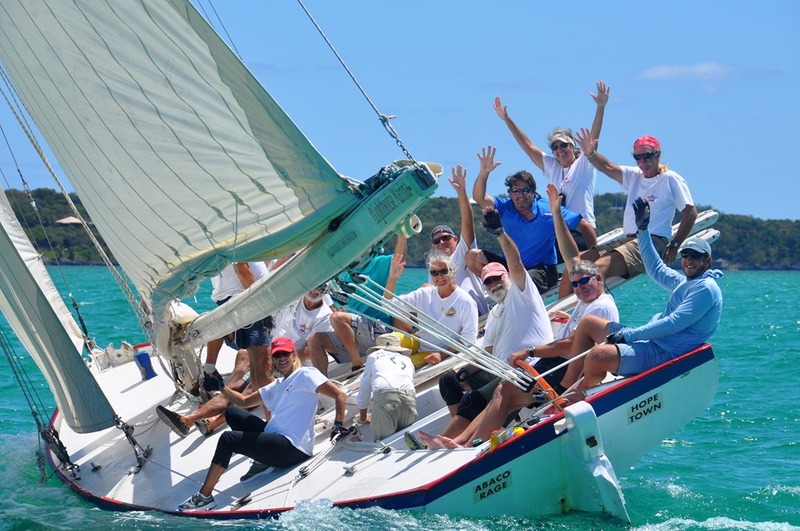 Rage’s skipper and tactician are masterful at starting a race – Rage was at the line in clean air just as the horn sounded. And it was a crowded start. At the second mark we had to jibe. We were frantically crawling from the low side to the new high side as the boom swung around. It smacked the water hard and dove in, dragging us over more. One of the crew toppled off the boat but luckily someone managed to grab her leg and get her back. 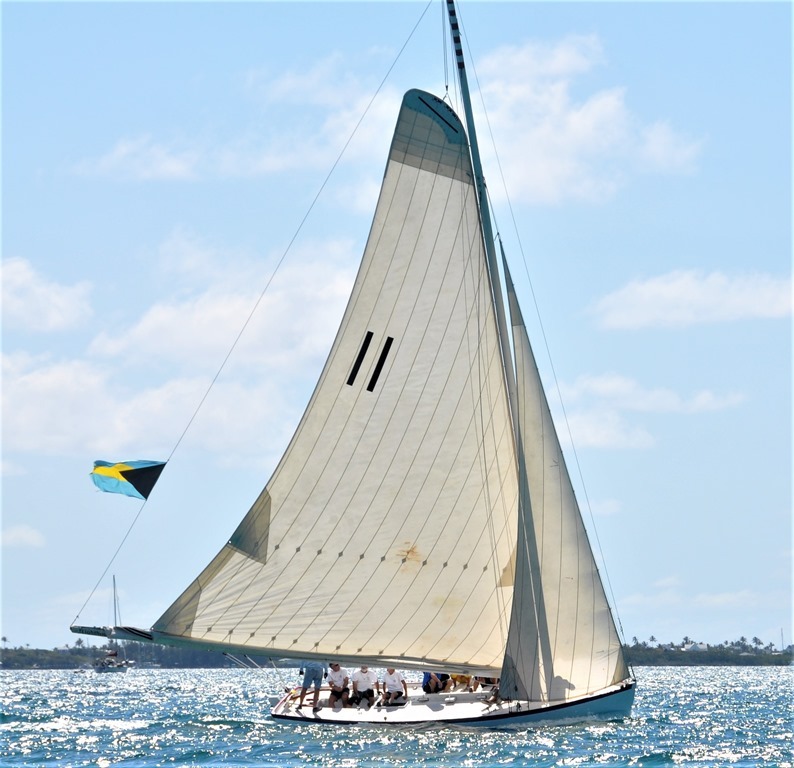 Meanwhile, we were crawling up the deck and onto the pries, trying to get the boat level – a difficult task because the bunched up, reefed-but-not-tied-off mainsail at the end of the boom had become a gigantic water catchment basin – fifty-five gallons of water, almost almost 500 pounds. This is what it looked like after we were finally under control again and a lot of the water had drained out. But we recovered and were soon on our way again. Here we are approaching the second weather mark. As you can see, we keep the boat at a perfect angle – rail just kissing the water – by placing our weight on hiking boards called “pries,” that extend out from the boat on the side the sail is NOT on. 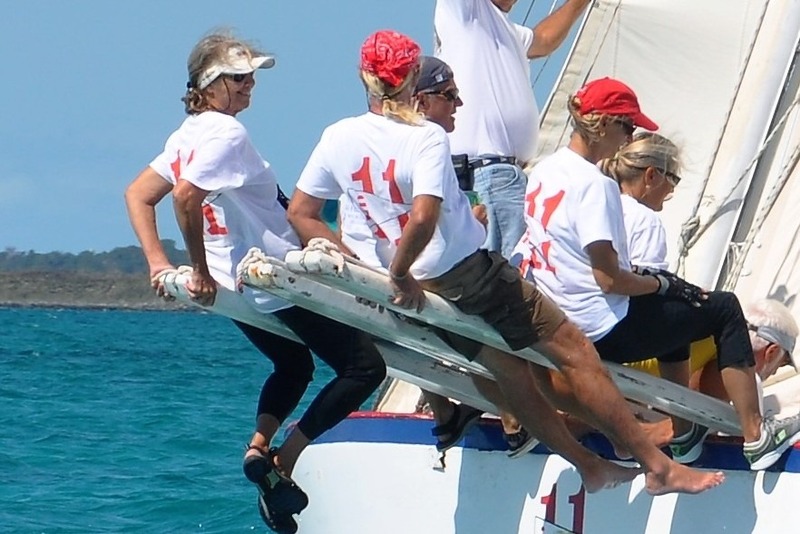 That’s me in the white “Rage” t-shirt and black Gill racing pants with padded knees and bottom – which have eliminated scraped up knees as I crawl across the deck. Once we’re in position on the pries, we hook our ankles together so we don’t fall off. 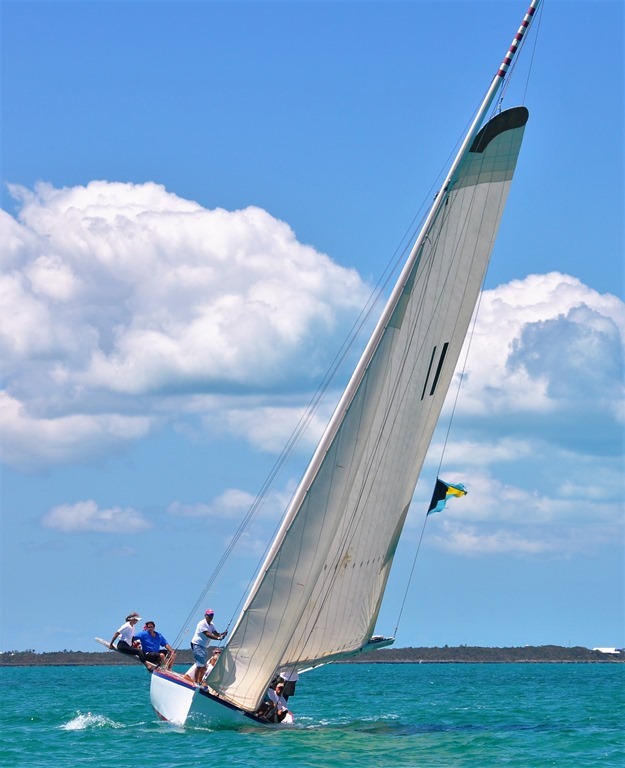 It’s the best ride in the Abacos – gliding along about 10 feet over that gorgeous turquoise water. That’s me, on the far left. Here’s Goldwin, in the middle of the picture below, at the shrouds. 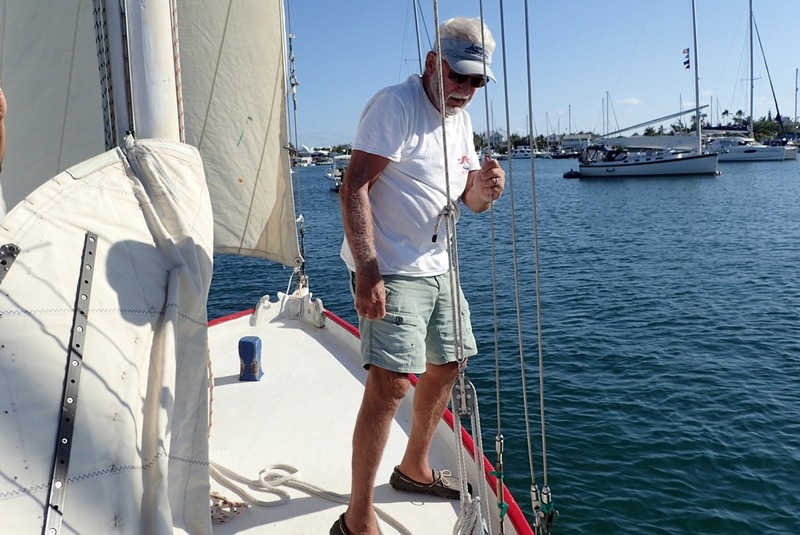 He helps work the foredeck – requires a lot more sailing knowledge than just moving your weight from one side of the boat to the other. At the finish, we all smile and wave! I’ve got both arms up high. Goldwin is in the middle, barely below the boom. 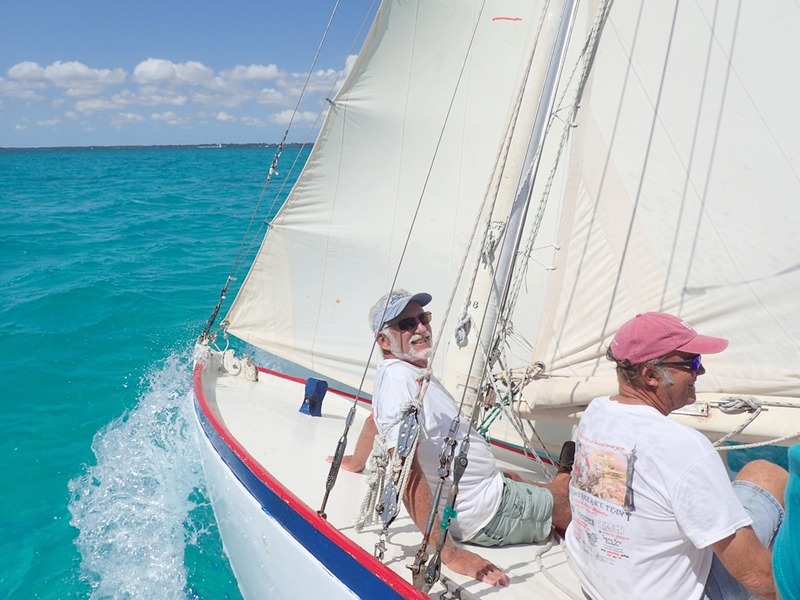 A fun day on the Sea of Abaco with great crew and perfect sailing weather. What fun for you (NOT for me! LOL). You guys are such seasoned sailors, and I am in awe!